In another indication that so-called “rewarded” advertising is gaining steam in digital advertising business, a collaboration of the Mobile Marketing Association (MMA), OpenX and MediaMath released findings of a study indicating that consumers prefer watching video ads that reward them. While that may not seem so surprising, the study also found that awareness and acceptance are also growing among marketers. Seventy-nine percent of 100 marketing pros interviewed by the group said they are either very or somewhat familiar with rewarded video advertising, though nearly half (47%) also said they had either a very or somewhat negative connotation about this method of incentivizing consumers to watch advertising. “I think the evolution of this has exactly been driven by the consumer,” says Maggie Mesa, vice president of mobile business development at OpenX, and a board member of the MMA who helped drive the research. Mesa says consumers are leading general marketers in adoption for two reasons. One is that they see the obvious benefits of being rewarded to do something that they see increasingly as an intrusion on their media experience. Another reason is that a wide variety of digital media developers -- especially gaming apps and platforms -- have been using rewarded advertising for years. Mesa estimates that rewarded advertising began to groundswell in the mobile gaming marketplace about “six or seven years ago,” then quickly began migrating into other forms of premium content that consumers would otherwise have to pay directly to upgrade in order to experience. 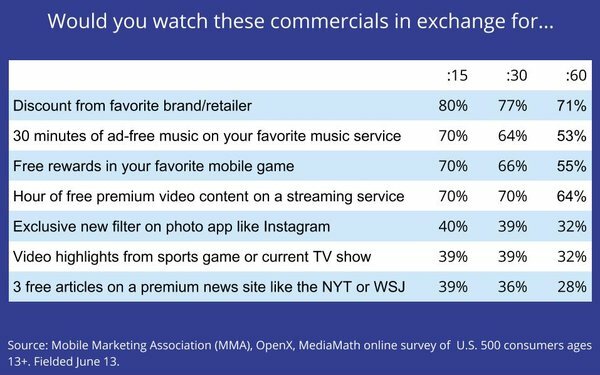 The most common examples would be music and video streaming services that enable consumers to opt in to complete a sponsor's video ad in order to unlock a short period of free -- and usually ad-free -- streaming. In fact, two-thirds (65%) of consumers responding to the group’s study said they had been offered a reward for opting into a video ad on a gaming site or an app. 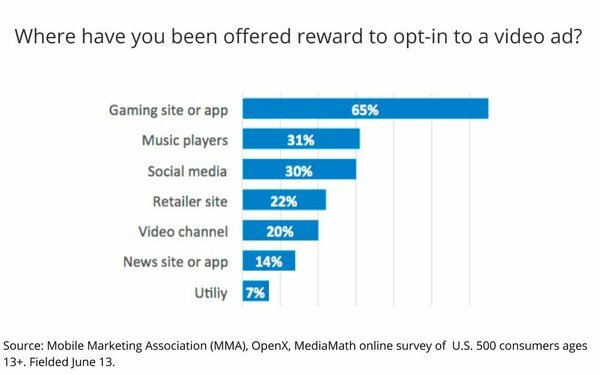 Less than half as many said they had been offered rewards to opt into ads on music players (31%), social media (30%), retailer sites (22%), video channels (20%), or a news site (14%). of U.S. 500 consumers ages 13+. Mesa says OpenX is interested in cultivating the rewarded video advertising market because it is part of the company’s overall push to focus on the most premium inventory for marketers and publishers. 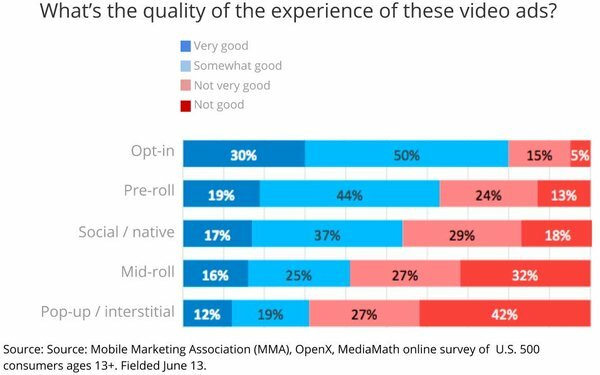 OpenX has been particularly aggressive in its focus on premium video, apps, 100% viewability, ads.txt, and other formats and mechanisms that weed out potentially less desirable inventory, and the use of rewarded opt-in video ads is the next logical progression, Mesa says. She acknowledges that the method is not entirely new, and did not necessarily begin with video game rewards. 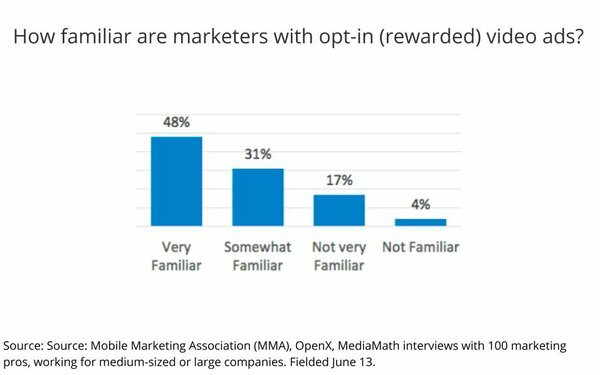 In fact, most pre-roll ads -- which require a user to complete them before unlocking the video or static content they are trying to access -- are effectively rewarded opt-in ads. But she also believes there's an opportunity for publishers and brands to utilize more explicit reward methods to motivate consumers to engage in more meaningful ways with brands. An OpenX spokesman adds that there is a already a body of data supporting that -- including data from its the company's demand-side platform partner MediaMath, which has been processing programmatic trades including rewarded opt-in video and conventional video ads. While a variety of sources -- mainly from the supply side, or supply-side enablers like OpenX and the MMA -- are pushing the concept (the Interactive Advertising Bureau recently formed a working group to explore the development of a rewarded advertising marketplace), there are still strong reservations among marketers, who see it as having a negative connotation, mainly because they have been universally opposed to incentivizing users to look at their ads. But the group’s research also indicates that aversion may also be going away, mainly because the rewarded ad model delivers the “KPIs,” or key performance indicators, brands are most trying to achieve with their advertising, including “viewability rates” and “return on advertising spend” (30% of marketers responding to the group’s study cited those as the top two KPIs delivered by rewarded ads), followed closely by CPM, or cost-per-thousand (27%). Those findings suggest that marketers don’t just find rewarded advertising models to be effective, but also cost-effective.